Peanut butter and jelly. Sonny and Cher. Seattle and rain. These are just some iconic duos that have always worked together. They are the yin to their yang, the Harry to their Sally, the… well you get the picture. Most things have a perfect partner, and Search Engine Optimization (SEO) and social media are no exception. It is not uncommon for someone getting into marketing to think that SEO is how someone shows up high on a Google search (true), and social media is where you post pictures and updates to show how fun you are (also true). But it’s time to start thinking beyond their individual definitions and start thinking of these two as a pair that can benefit each other. Online marketing can’t be put into silos anymore. Everything you do online—social media, SEO, reviews, blogs, etc.—all play in role in the success of your business. Link Building: Link building is the process of building a network of links that direct back to your preferred destination (i.e. your website). Posting content on social media gives you the opportunity to spread the site you’re trying to promote to more people than you would reach through other means. When people click on content links like a blog shared on your Facebook page, for example, that’s quality traffic going back to your website. This could also come in the form of a special offer you post about, or any content that gets picked up by your followers and prompts them to want to learn more about you. Increasing Brand Awareness: Social media gives you a platform to tell your story. Your story is your brand. What makes you unique, the best in your area, etc.? When you share your story, you are building a connection not just with your followers but also with potential future patients. This helps drive people to your website and increases the likelihood of them searching for your business specifically on Google, which helps boost your SEO. Similar Strategies: If you have ever done a search online, you have likely seen that results also include things like video links, tweets, Facebook pages, etc. Google may present these results as if they were web pages. So think about your social media content as you would think about doing SEO on your website. What are people looking for and how can you be the best option for that? Online Reviews: Reviews play a direct role in your organic rankings. The more quality reviews that Google is able the find, the better you are able to perform in searches. Social media networks provide both an avenue to leave reviews as well as direct people to other areas you would like reviews to be left. 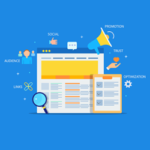 And, as you get more and more reviews, it makes it that much more likely that a potential customer is going to want to visit your other networks and website. Boost Local SEO: Google looks not only at what you are searching for, but where you are searching from. Social media networks are another helpful source for map markers and NAP (name, address, phone number) consistency. This is foundational for good SEO. Additionally, networks like Facebook allow for “Recommendations.” Your business may be tagged as a recommendation in the local area which will drive clicks, traffic, and hopefully business. These are just some of the ways that SEO and social media work together. Prospective customers are no longer just clicking on the first link in Google and calling that business. They are going to look at all aspects of your online business, and many of those are the same things that tell Google where you should appear in their search. So next time you are deciding on where to focus, don’t ask yourself whether you should do one or the other, ask yourself how you can make them work together!